Get gentle yet effective sun protection for allergy-prone and reactive skin with the Eucerin Sun Allergy Protect Sun Cream Gel For Face and Body SPF50, a high tolerance formula. Sun-induced skin reactions and intolerances such as polymorphic light eruption (PLE) are an increasing concern, resulting in cell damage and inflammatory and allergic reactions. This caring crème-gel is infused with an effective plant-based complex, including Alpha-Glycosyl-Rutin to provide antioxidant care, and licorice extract to stimulate enzyme production and protect cells against free radicals. The pared back formula is free from perfume, emulsifiers and preservatives to minimise the risk of irritation and allergy, while the very high UVB/UVA sun filters ensure that the skin is optimally protected against the skin damaging effects of UV rays. Water resistant, free of perfume, emulsifiers and preservatives. 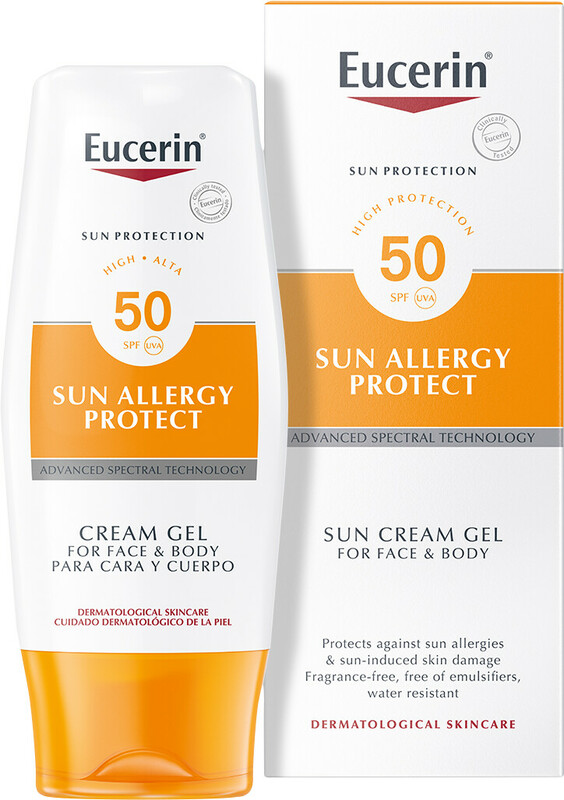 Eucerin Sun Allergy Protect Sun Cream Gel For Face and Body SPF50 150ml is rated 5.0 out of 5 by 2. Rated 5 out of 5 by Shaina from Favorite Body Sunscreen! This is my favorite body sunscreen. I wish it was available in the US so bad! Its gel formula is smooth and silky, easy to spread and rub in quickly. I do not feel like it leaves a tacky film or a white cast of any kind. It's scent is mild and it doesn't seem to aggravate my sensitive skin. As someone who really loves their pale skin, this works well to keep me from burning. I apply only once in a morning for most of my days, but I reapply if I am out in the sun for hours. Excellent product. I will keep coming back. Rated 5 out of 5 by Kags from excellent product Very happy with this product - and the Eucerin brand generally - as I am prone to sun allergies and fair skinned. Coped with California sunshine (and mosquitoes) very well!